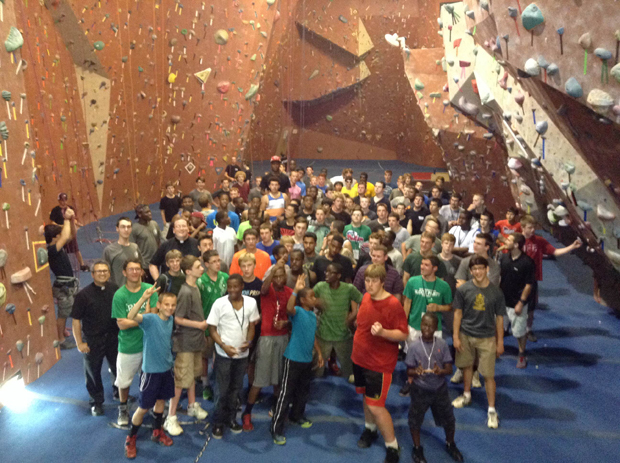 The young men at Quo Vadis Days had a good time at the rock climbing course and many other activities during the three-day retreat in Quarryville, Pa. The Quo Vadis Days retreat offered time for reflection and discussion with adult volunteers, many of whom were seminarians of St. Charles Borromeo Seminary. These words from the pontiff served as the theme for this year’s Quo Vadis Days retreat by the Archdiocese of Philadelphia, which was held June 29 to July 2 at Black Rock Retreat Center in Quarryville, Lancaster County. “Quo vadis” is Latin and translates to “Where are you going?” Legend has it that St. Peter posed this question to Jesus on the outskirts of Rome. Quo Vadis Days is a three-day camp for young Catholic men to deepen their faith, learn more about the priesthood and better discern God’s will for their lives. It was started in the Archdiocese of Portland, Oregon, in 2000 as a response to Pope St. John Paul II’s urging of the church to begin the New Evangelization. In the Philadelphia Archdiocese, the Quo Vadis Days program began in 2009 and is held each year in early July. 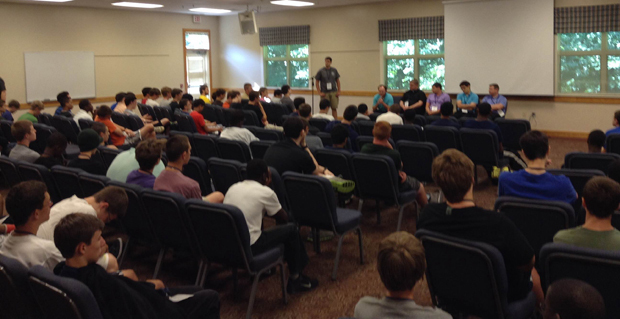 This year the camp welcomed 101 young men between the ages of 13 and 18 and mostly from archdiocesan parishes but also from some surrounding dioceses. The young men were challenged to grow in their faith and answer two questions: Who am I as a person? Who am I as a man of God? In previous years attendance has ranged between 20 and 40 participants. This year the cost of the retreat was considerably defrayed due to the generosity of a grant, which made it more affordable for the participants. The Quo Vadis Days campers tackle a rope climbing course, one of the fun activities they enjoyed at the vocation discernment retreat. “This year, we have seen a much more diverse group of young men,” said Kurt Zampier, an organizer for Quo Vadis Days. Previously, the group’s primary make-up was Caucasian men, but this year’s campers included Hispanic, Asian and African-American men, as well as those from Nigeria and Kenya. “It is a tremendous representation of the make-up of the archdiocese,” said Zampier. The retreat was directed by Father Stephen DeLacy, who is the director of the archdiocesan Vocation Office for Diocesan Priesthood. This year he was assisted by 22 adult leaders made up of permanent deacons, seminarians and lay adults with a ratio of approximately one leader for each four campers. The schedule of activities shows a healthy mix of reflection, spiritual formation and recreation. 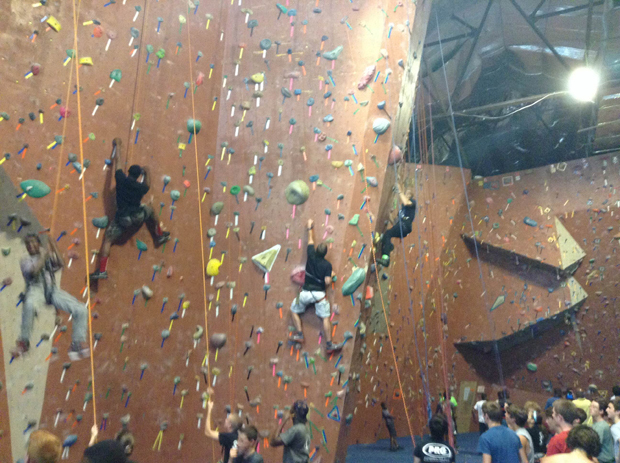 This year, in addition to the daily opportunities for community and individual prayer, campers had opportunities to play soccer and ultimate Frisbee, tackle a rope climbing course, swim or boat in a lake, relax around bonfires and go on a rock climbing expedition. “Because the guys were so well behaved, we decided to treat them and let them watch the World Cup play-off game between the teams from the United States and Belgium,” said Zampier. The program is designed to bring growth to the whole person — spiritually, emotionally and physically, he added. Seminarian Alex Pancoast, who is from St. Ephrem Parish in Bensalem, has taken part in Quo Vadis Days all six years since it started in the archdiocese. The first two years were as a camper and then as an adult leader since entering the seminary. This year he served as the head master of ceremonies, helping to organize events, calling campers to scheduled activities and introducing all speakers. He jokingly added that one of the hardest things for them to do the first day was to surrender their cell phones and electronic devices. One camper who missed his cell phone at first was Charlie Harrison, 16, from St. Helena Parish in Blue Bell. “It was difficult the first night, but as the retreat progressed, we missed our cell phones less,” he said. Zane Christmyer, 18, from St. Norbert Parish in Paoli had a different reason for missing his cell phone. “I use it as a watch and alarm clock, and was afraid of over-sleeping,” he said, adding that he enjoyed the fraternity shared during the activities. Samuel Wong, 17, who belongs to St. Raphael/Holy Angels Parish in Hamilton, N.J., in the Diocese of Trenton, admitted that spiritually, “I’m not quite where I need to be, but I’m trying to do what God wants.” Wong noted that the opportunities for interaction like this with other young men don’t happen very often. “I am coming away from this experience with a better sense of self-awareness, and of what God may want of me,” said Joseph Nguyen, 16, of St. Andrew Parish in Newtown, Bucks County. “Everyone has their own pace of discerning, and there is no shame in that,” said Bidley Jean-Baptiste, 15, who belongs to St. Barnabas Parish in Philadelphia. “We are spiritual, straight-forward and honest,” added Ifeanyi Okorji, 15, from St. Cyprian Parish, also in Philadelphia. Montana Millward, 18, of St. Joseph Parish in Downingtown, began collecting phone numbers and contact information of the new friends he made during the retreat once he received his cell phone back in a makeshift “graduation ceremony” held on the last day. That observation very much sums up what Father DeLacy hoped these young men will take with them from the experience. “We are here to challenge them to grow as men of God by meeting them where they are and giving them the tools to discern God’s call in their lives, be it priesthood, marriage or profession,” Father DeLacy said. George Gregory is a freelance writer in Coatesville. Summer Camp in a Catholic setting is the best we can do for young kids. I remember ST. Monica’s camp. back in the 50’s.